Last week, Project Connect (PC) held several community workshops to gather input on evaluation criteria and sub-corridor priorities. This is part of the public input process leading up to City Council selecting a ‘locally-preferred alternative’ for the initial sequence of urban rail. This process is intended to inform the recommendation the urban rail lead is preparing for the Central Corridor Advisory Group. So what transpired? 1. Lamar keeps its early lead. East Riverside emerges as a serious contender. Each workshop included a question about sub-corridor preferences at the onset and then at the conclusion after some data was shared with participants. These results are not scientific, obviously. They are probably best understood as a proxy for existing mindshare of highly-engaged civic enthusiasts as well as the strength of organization and overall passion-level by pro-Lamar folks. That said, I was personally surprised by how strong a lead Lamar scored over Mueller given the hegemony of the latter in discussions for the last several years. I’d be frankly surprised if Mueller is recommended or even kept amongst the top set of choices. It just doesn’t have a passionate grassroots constituency and it is not that strong a choice for the institutional players or elected officials based on the data. The other interesting development is the boost that East Riverside would get as workshop participants saw data. It seemed to emerge as the data-driven alternative to Lamar. I would not be surprised at all if it is recommended, mostly because of the quirks of our local political and policy-making culture. The PC staff really seem to believe and have sent repeated public signals that for some completely mysterious reason MetroRapid precludes investment in Lamar. I disagree and wish that CCAG and Council would get to the bottom of this reasoning if the data continue to support Lamar as a top choice. 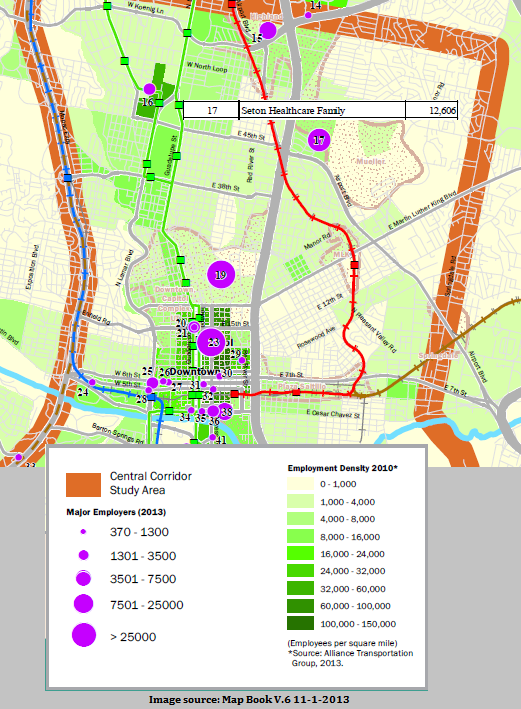 East Riverside (or potentially Highland) is likely to be recommended because it scores well on the data, makes intuitive sense, and doesn’t require the awkward conversations about federal funding and staff competence if Lamar is selected. Project Connect’s Map Book, its online tools, and its community presentations all continue to exhibit non-trivial data issues. Participants in last week’s workshops all had to make rushed choices about their sub-corridor preferences amidst this messy data ecology. This is not the result of staff or consultant incompetence or malice. Rather, it is the foreseeable result of a crammed decision-making schedule sanctioned by policymakers such as the Mayor. Let’s review some of the outstanding issues that impacted the sub-corridor selection. For example, the Map Book continues to visualize large employers as concentrated purple dots at the main address of an organization instead of distributing the employment across the actual addresses or skipping the confusing visualization altogether. Further, the underlying demographic allocation tool that generates the shades on the Map Book maps is not yet open. 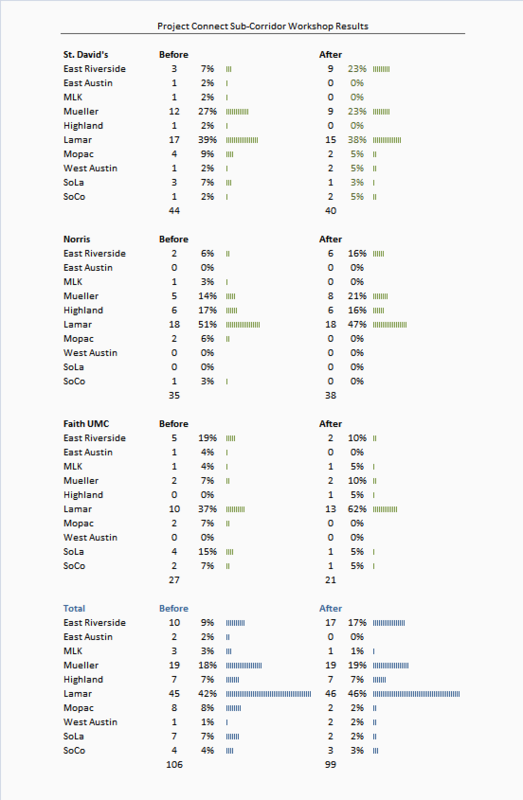 At the Austinites for Urban Rail Action Map Book Data Dialogue I received an explanation that the allocation tools uses a set of eight ‘parameters’ to score each Austin parcel en route to receiving a share of the overall expected share of the region’s growth. My expectation is that policymakers would want to understand and validate such a model and that the public would be allowed to provide feedback on it. As the sub-corridor workshops, new data and accompanying visualizations were revealed. 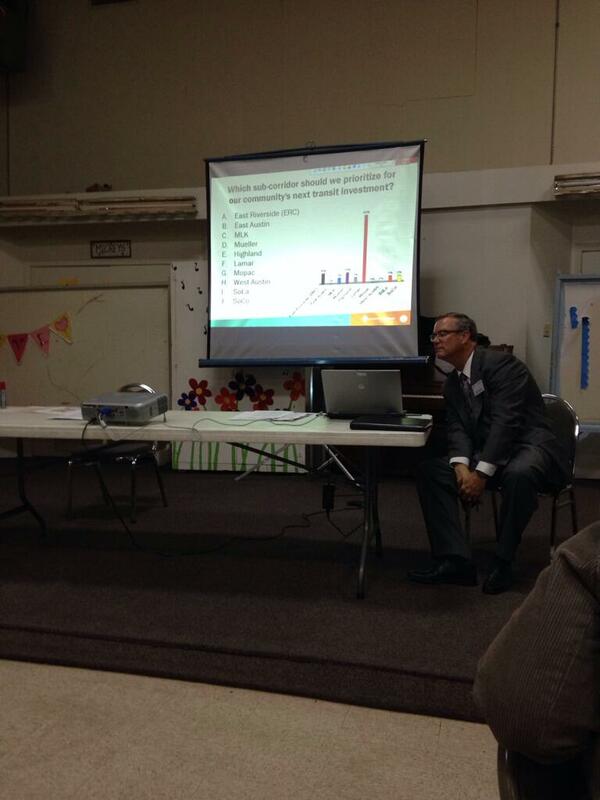 The charts below seemed to generate a lot of conversation and might be persuasive to CCAG or Council. However, the precise ways that these were calculated remain unreleased. And previously detailed, we are left with using hacks like scrutinizing AJAX responses to figure out the design of some of these measures. As if that weren’t obscure enough, there are errors that lead to further confusion. 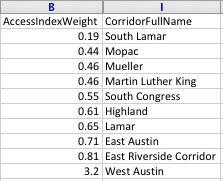 Dan Keshet and Jace Deloney deciphered the above error in the weights assigned within the PC online survey web application that gave the West Austin corridor ten times the intended weight; this led to the West Austin corridor being recommended as a top choice for all survey respondents regardless of their criteria preferences. The error was corrected as a result of our highlighting the issue, but then the application stopped releasing the weights in its AJAX responses (!). The process is moving quickly because of a desire by someone – probably the Mayor – to get a decision made to ensure a November 2014 election given the uncertain policy future after the switch to single-member districts. I am not personally upset by the evolving data quality of the process; but I am concerned that the rush to finish the Central Corridor Advisory Group process makes it hard to address the data quality issues and actually make a good decision. If we want staff and consultants to share, we have to support constructive iteration on work products and tools. However, it seems that the schedule is making it impossible for them to achieve those goals. While the urban rail lead and Project Connect staff will be making a recommendation to CCAG and that body will also be making a selection, it is important to view those selections as ‘drafts’ made with unstable information. Council has the clout to ensure that the data they use is high quality and their final stretch of public engagement allows more open back-and-forth between sub-corridor proponents. Hopefully, they will ensure a careful final vetting of the sub-corridor options based on quality data, that has clarity about FTA funding guidelines, and is not clouded by previous affiliation with the Mueller/Lamar debate. I beg to disagree. SOME of the errors were minor things caused by rushing. Some were not. As I detailed in this blog post, some were so egregious that there’s no way they would have gone out if anybody had cared the slightest. 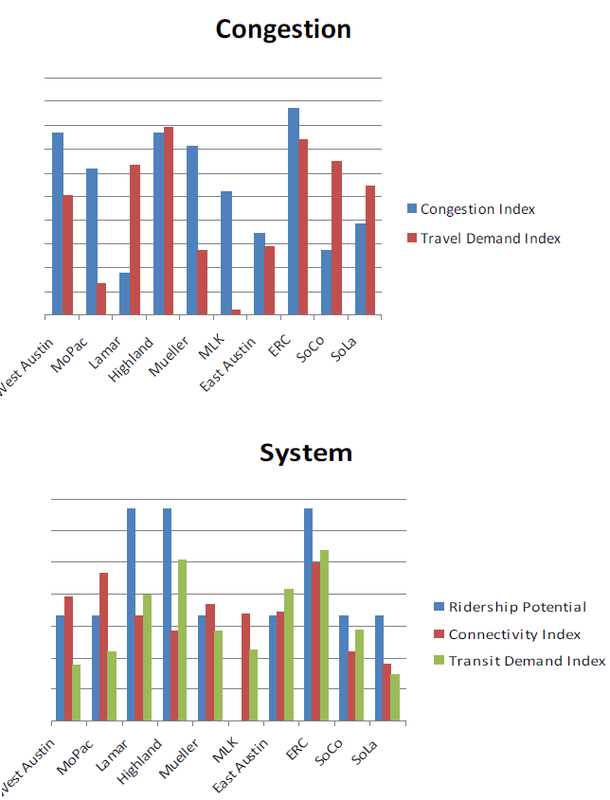 Simple incompetence doesn’t even explain it; if you as a person with even the slightest knowledge of transit patterns in Austin allow something like that to go out, the only two plausible reasons are that you either have an active disdain for the people getting the obviously, horrendously, wrong reports; or you have an interest in misleading those people.